TOYOTA HAS EDGED A STEP CLOSER TO A WRC RETURN AFTER A SPOKESMAN FOR THE JAPANESE MANUFACTURER’S MOTORSPORT ARM TOLD WRC.COM THAT IT ENJOYED A POSITIVE FIRST GRAVEL TEST OF ITS NEW YARIS WORLD RALLY CAR. The car, known as the TMG Yaris WRC, is fitted with Toyota’s 1.6-litre Global Race Engine and was tested in Italy this week by experienced Finn Sebastien Lindholm and former Subaru pilot Stephane Sarrazin. The test was coordinated by Mini’s former WRC partner, Motorsport Italia. Toyota’s motorsport division, TMG, is keeping details of the test private, but a spokesperson revealed that the team was happy with how it had gone. He also confirmed that it was the first of several tests planned for this year, as part of a long-term project. Toyota was one of the most successful WRC manufacturers of the 1990s, achieving four drivers’ and three constructors’ titles before switching its focus to F1 in 1999. Toyota Motor Corporation president Akio Toyoda said on a Japanese WRC TV programme in January that the firm would like to come back to the WRC, but he did not say when this might happen. 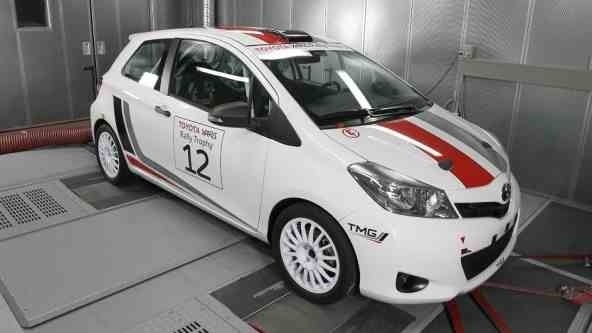 It is certain that any return will not be with the car currently on test, however, as the spokesman confirmed that the TMG Yaris WRC will not be homologated for competition. It is more likely that Toyota will return with a different car, conforming to new WRC technical regulations that come into effect in 2017.